Have you made reservations for Mother’s Day brunch yet? Please, oh please — don’t make a mess of the kitchen. We appreciate the leaden pancakes and orange juice spilled by children’s hands, but we hate to tackle dried batter on the counters later. Take us out to brunch. Or at the very least, bring Mother’s Day brunch home! I am consistently amazed by the tasty and affordable “to-go” options at Brentwood’s Fresh Market. Gorgeous roses ($7.99 a dozen! ), plump blueberry muffins, specialty juices, Peet’s Coffee — take your kids on a shopping trip and surprise Mom at home. Believe me, she’ll love it! 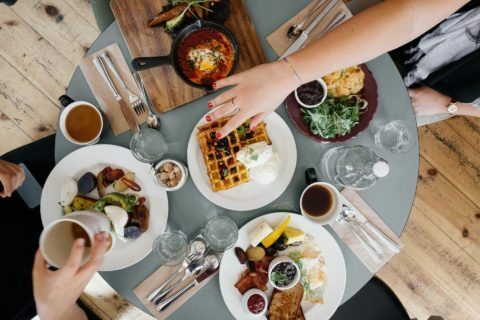 If you’d like to gather the siblings and take Mom out on the town, here are a few good brunch restaurants near Nashville. To the list above, I will add a new favorite: The Copper Kettle in Green Hills. Its location on Granny White Pike near Lipscomb makes it convenient to Brentwood families, too. This mom loves the buffet’s goat cheese salad with roasted asparagus, but the men in the family will be amply fed by the carving station and the house-smoked salmon. Plus, kids 5 and under eat free. City Winery Nashville is also having a Mother’s Day brunch — featuring the Nashville Jazz Orchestra Quartet! I’m told there is limited seating inside the restaurant and at the outdoor patios, so you’ll want to make reservations. Sleep is precious to moms. Why not let her sleep late (FREE) and celebrate with a picnic at Deerwood Arboretum? The thoughtful dad will stop by the Puffy Muffin on Saturday and pick up a cake or cupcakes to go. They’re not just for birthdays, you know! If you’re running short on time, a convenient place to find Mother’s Day gifts is in the shopping center on Franklin Road. Florists say that Mother’s Day is their busiest holiday of the year! Don’t count on FTD to do all the work. Send your mother a beautiful arrangement from our list of tasteful local florists. Here are some other Nashville-themed gift ideas for mom. Here’s a slew of other Nashville Mother’s Day lunches & brunches.